"Toss together this quick and easy vegan sheet pan dinner of roasted baby potatoes, green beans, chickpeas, and tomatoes seasoned with basil." Preheat the oven to 425 degrees F (220 degrees C). Line a jelly roll pan with aluminum foil. Toss potatoes with 1 tablespoon olive oil in a medium bowl. Pour into the prepared pan. Roast in the preheated oven until tender, about 30 minutes. 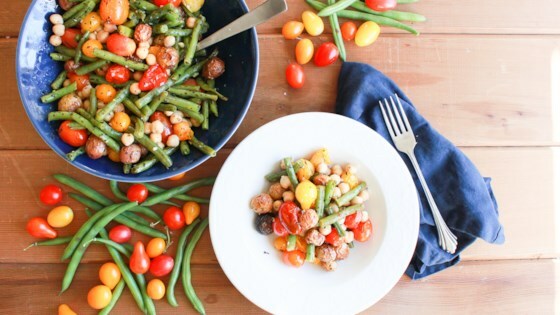 Toss cherry tomatoes, green beans, garlic, basil, and sea salt with 2 tablespoons olive oil. Remove potatoes from the oven, push them to one side of the pan, and add the tomato and green bean mixture. Roast until tomatoes start to wilt, 15 to 20 minutes more. Remove from the oven and pour into a serving dish. Stir in garbanzo beans, add 2 teaspoons olive oil, and season with salt and pepper. See how to make a hearty, spicy bean filling for tacos and burritos. It was very tasty with the olive oil and basil I did not have green beans, but used broccoli instead and it was delicious! Used less olive oil and doubled the basil. It was much better than it looked. Easy to make, inexpensive, and an instant hit with the family! Cleanup took 1 minute. I have saved this recipe! This is really good. I added some vegan sausage to mine. The flavor was outstanding, especially the cherry tomatoes. Thank you.